Imagine staying in a home at one of the world's most desirable destinations - Times Square. (Click on "Owner Info" above for other identical unit if this unit is booked or send in an inquiry mentioning the dates you want. At "Owner Info" click on "All my rental listings - or you can go to VRBO Listing #879646) Available December 11 - December 28, 2018. This building is a rare and unique residential condominium at the gateway to Times Square and Rockefeller Center, in the heart of New York City. 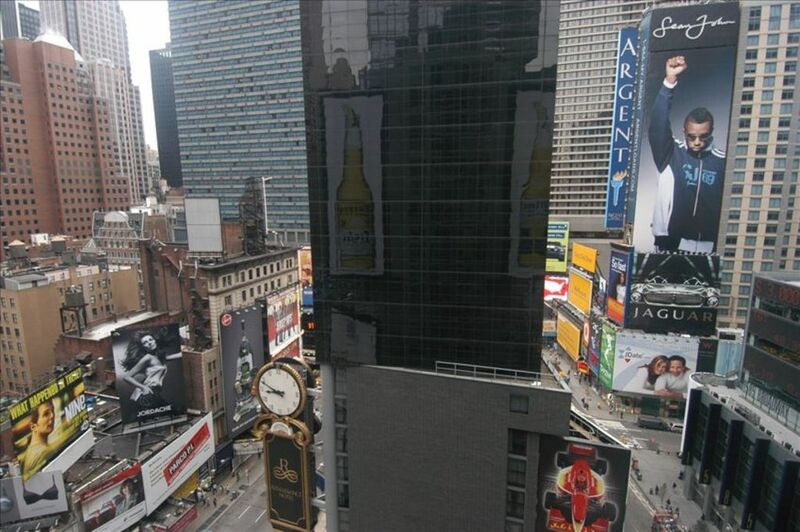 Spotlight Vacation Club units are actually in Times Square, not 1 or 2 blocks away. Our Destination Club also has condos in California, Hawaii and Wyoming. Membership in Spotlight Vacation Club is required under the new New York law which also requires rentals of 30 days. Call for more information. Built in 2006, this world class property has it all, design and interior finishes that rival any five-star hotel and a location that is one of the most desirable destinations in the world. This is a spectacular residence for those who truly want a unique and elegant vacation in the city that never sleeps. This luxurious residence offers a master bedroom and living room with floor-to-ceiling windows and a glass-fronted view of Times Square with dramatic views of the city skyline. The kitchen is designed to accommodate casual cooking or formal entertaining, with granite counter tops and high-end appliances. The bedroom features a king size bed with 600 thread count sheets as well as a comforter. TV and HBO are also available in the bedroom. The living has a sectional couch which pulls out to a double bed. A 37' TV is mounted on the wall. NO SMOKING PLEASE! The entrance leads you into a spacious and welcoming lobby with a full-service concierge desk staffed around the clock. The fourth floor offers a state of the art fitness center, entertainment lounge, billiards, catering kitchen, fully equipped conference center, virtual golf, and a sprawling landscaped plaza with a practice putting green. Relax with the paper on the grass then enjoy cocktails with friends in the lounge. The fourth floor is a place to exercise, conduct business, entertain or simply relax. The condo redefines city living at its best. Watch the lights on Broadway, sunbathe, and enjoy the expansive rooftop observation deck. Have a street side lunch in Rockefeller Plaza, just two blocks away or walk to the great shopping nearby on 5th Avenue. Stroll through Central Park; take in a show at one of the nearby theaters, or shop in the famous fashion district. Just one block from the nearest grocer, allows you to prepare meals at your leisure in the privacy of your own home. You’ve never experienced New York like this before, make it special. I am an attorney and my wife and I live in Northern California. Together we run Spotlight Vacation Club, a family enterprise. We enjoy being the only condo actually in Times Square. New York is a great place to visit and it is fun being in the heart of the theater district. We visit New York every few months to not only make sure that the condominium is in top shape but to enjoy theater, restaurants and shopping. The lights of Times Square are awesome from our living room window. The building has 24 hour concierge service and security. Spotlight Vacation Club also has condos at Lake Tahoe, Waikiki Beach, Turtle Bay Resort and Jackson Hole, Wyoming. The Tkts Tkts booth is one block from our condo so we can easily check on low priced theater tickets at the last moment. The subway stations are 1/2 block from our location so we can easily get to Yankee Stadium, the Mets new stadium or the US Open Tennis Stadium as well as the airports. Clean, spacious, comfortable. Had everything we needed and location can't be beat. I'm admittedly sensitive to mattress type and I slept really well here. Bill was very and accommodating to our arrival/ departure times. Hope to stay again next year. Thanks! Great small apartment - exactly as advertised & more! After reading 50+ 5-star reviews, I was fairly confident in the rental, but even then "all the little things" exceeded expectations. Kitchen, bathroom, laundry/dryer stocked and ready to go, etc. The few times I had questions while there, I simply emailed the owner and he or his wife responded almost immediately. 5-stars all around. The unit was just as described. Very well appointed and in a can't-be-beat location. Bill was very easy to work with as well. Great apartment and location! All shows are walking distance, Lots if restaurants to choose from and easy access to subway which cam take you anywhere. We took the subway to the Mets game Sunday and them the Yankees game Monday. The apartment itself had everything you need, is very clean and comfortable with awesome views of time square. Our residence is the only condo building actually in Times Square and the theater district. Rates can be flexible especially if you contact us within 30 days of arrival.